NENA has the greatest group of Outreach volunteers. Helena Nealy, Paulette Kennedy, Debbie McHenry, and Carmen Demourelle represent various nonprofit groups throughout the city. From NOLA for Life, Second Harvesters, Ceasefire and others, expect to find these ladies at the forefront of community involvement. From community feedings and helping tornado victims to addressing difficult issues like domestic violence and child abuse, NENA volunteers provide the energy and leadership required of long term community development. Volunteers from Xavier High School in Appleton, Wisconsin traveled 18 hours to volunteer and perform service hours in the Lower 9th Ward of New Orleans. They painted and cleaned up the properties of several residents in the community. 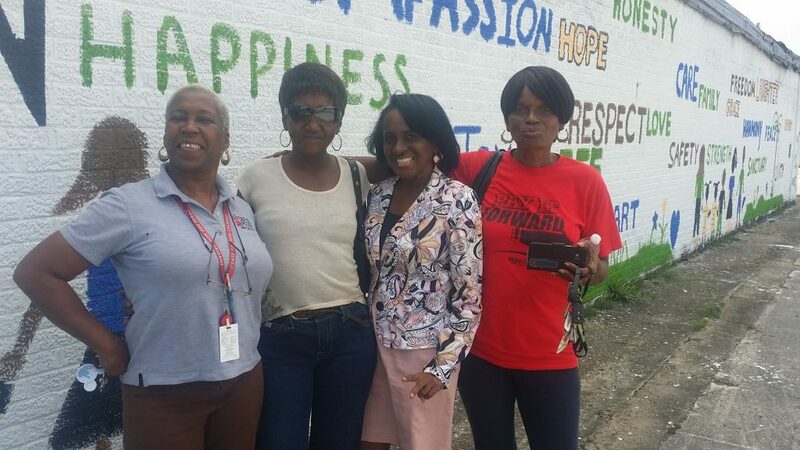 In this video, they take a break from painting the mural at 5701 St Charles.